Oracle 18c is a freely distributed operating system based and compatible with the Red Hat Enterprise Linux distribution. It is an enterprise-ready server Linux OS designed to be used on small and medium-sized businesses. Oracle Database (commonly referred to as Oracle RDBMS or simply as Oracle) is a multi-model database management system produced and marketed by Oracle Corporation. Cognosys provides hardened images of Oracle 18c on all public cloud i.e. AWS . Oracle Move is cost effective. The same flexibility that lets you directly migrate your Oracle Database to the Oracle Cloud is applied to finding the most cost effective solution for the purpose and duration of the migration. Oracle Move is highly available and scalable. The tight integration of all migration tools with the Oracle Database lets you maintain control and gain better efficiency when moving your databases into the Oracle Cloud. Oracle Move offers simplicity and efficiency. Oracle automated tools make it seamless to move your database to the Oracle Cloud with virtually no downtime. Using the same technology and standards on-premises and in the Oracle Cloud, you can facilitate the same products and skills to manage your cloud-based Oracle Databases as you would on any other platform. Step 2) Database Details: Oracle sample DB cdb1 and pdb pdb1 has been created. Note : Please change the password after first login. 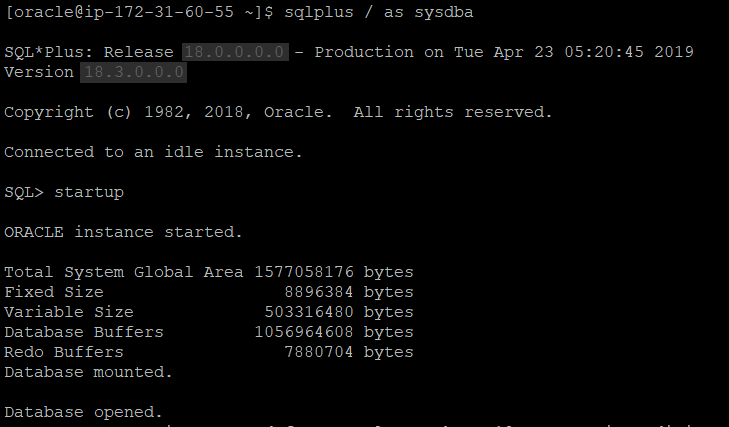 Please login with sqlplus / as sysdba as oracle user and startup the sample db configured in /etc/oratab. 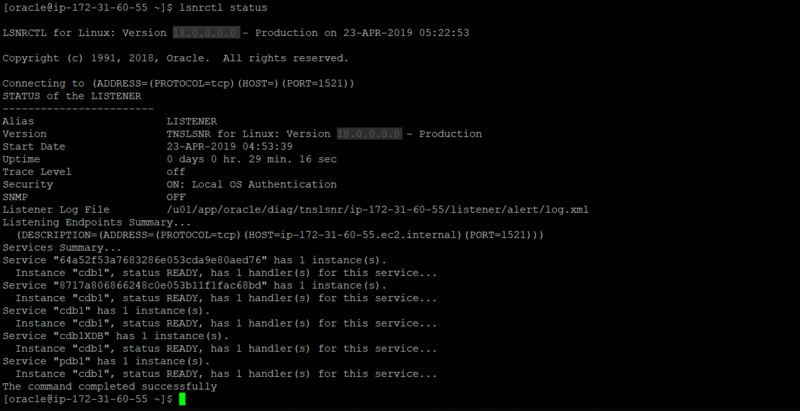 After doing db startup in sqlplus you can check the status using lsnrctl status command. ​Please use service dbora stop or start and start_all.sh or stop_all.sh script in /home/oracle/scripts to manage the listener.